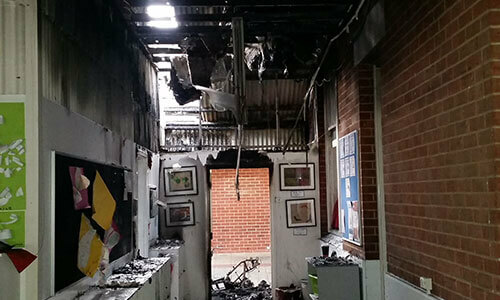 IPS were called to assist other trades in the make safe and clean up of 6 classrooms following a fire in the early hours of Saturday 4th July 2015. Unfortunately 2 classrooms we significantly damaged and needed to be rebuilt. The remaining 4 classrooms, teachers preparation room and the enclosed corridor where all significantly fire affected and needed cleaning and restoration. 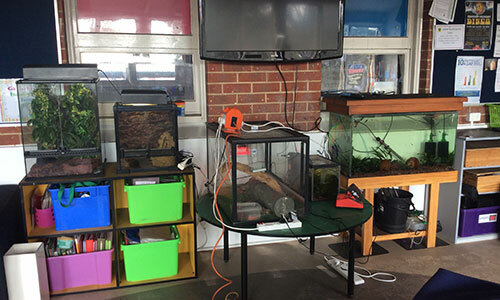 The first job allocated to IPS was the setting up of a temporary power supply to power the various animal tanks and enclosures which needed power for heating, water filtration and other environmental controls as by now they had been without power (no heating or water filtration for over 7 hours) . IPS was able to have our genset onsite within the hour and had the various tanks and enclosures operational till a more permanent temporary location could be sorted out. 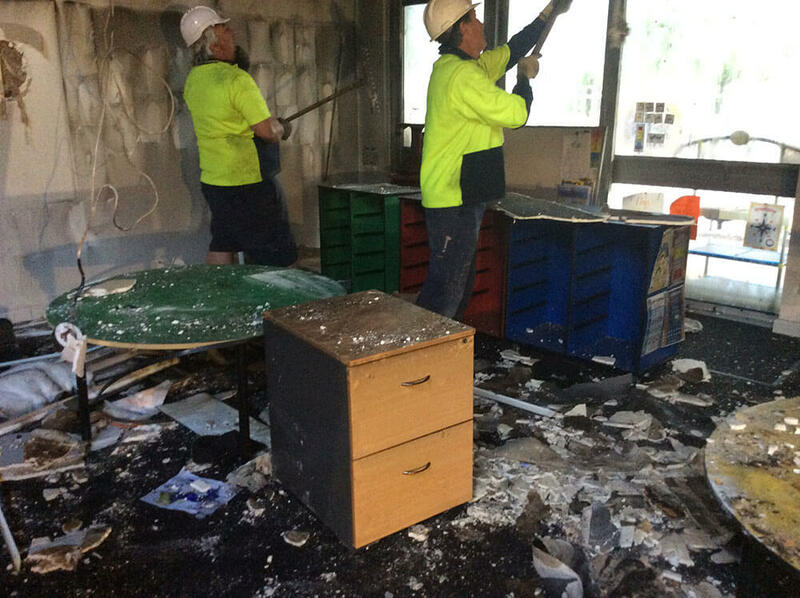 In conjunction with the appointed builder Keves Building Works (KBW) IPS crews spent the weekend cleaning up the 2 damaged classrooms and commenced the pack out of the remaining rooms and corridor area. Between the two organisations arrangements were made for waste skips to arrive and the first of 2 shipping containers where delivered, along with the temporary fencing to secure the area as the school had a school holiday care program operating during the school holidays. 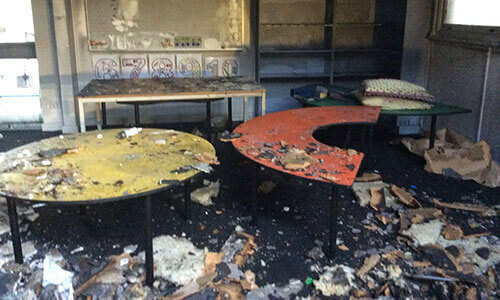 As the fire had occurred on the first Saturday of the July school holidays the disruption to students was not as significant as if the fire had occurred during the school term. With the need to repaint all the painted surfaces and cleaning of all non-paintable surfaces and built in furniture the decision was made that all contents be packed out hence the 2 shipping containers. Over the next 2 days IPS crews commenced to pack the contents into over 300 packing boxes, which were loaded into the 2 shipping containers. At a meeting on the Monday with Education Department officers and the school principal the decision was made that the 4 affected classrooms would need to be operational in the first week of the new term 15 days away with the classrooms and contents handed back to the teachers for setting up the rooms in 11 days’ time. By the Tuesday night all the packed out contents, furniture and non-packable items (2 large & 1 small removalist trucks) were transported to the IPS warehouse for cleaning and restoration in its packed up state the amount of goods filled over 500m2 of warehouse space. In addition to these contents over 150 electrical items (IPads, Electronic white boards, TV’s) were packed up and sent to our electronics restoration contractor (Telefix) for assessment and restoration. IPS crews remained onsite working with the builder to clean and restore all remaining items as required our final task included cleaning all the carpeted areas and a final wash of all hard floors. Back at our warehouse we resourced up to meet the challenge of having all the contents cleaned restored and packed into clean/new boxes (another 200 boxes) prior to being returned to the school in time for the new term. Some items once cleaned needed to be Ozone treated prior to being repacked. Prior to restored items being returned to the school the building was ozone treated. 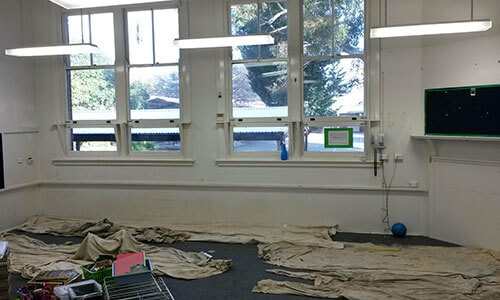 As classrooms where finished cleaned contents where moved back to the school in preparation for set up. Once all the contents had been returned and the rooms effectively set up for start of school on Monday the area was again Ozone treated. As a result of a coordinated team effort IPS and KBW we were able to hand the classrooms back to the school on the Friday, IPS teams worked through the weekend with the school staff to have the rooms ready for the student return from holidays. Full classroom operations commenced on the Tuesday morning 16 days after the outbreak of the fire. 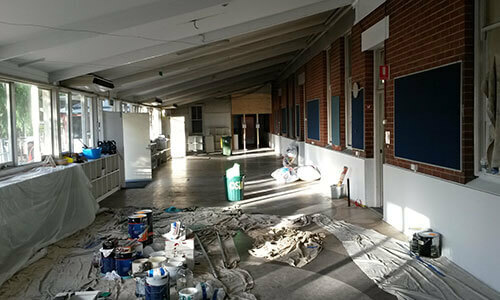 As demolition works where ongoing IPS arranged for the classrooms to have HEPPA air scrubbers installed till the demolition was completed.